Not to be confused with Swiss migration to France or Swiss French people. Map of the Arpitan language area, historical language spoken in Romandy, with place names in arpitan and historic political divisions. Swiss French (French: français de Suisse) is the variety of French spoken in the French-speaking area of Switzerland known as Romandy. French is one of the four official languages of Switzerland, the others being German, Italian, and Romansch. As of 2015, around 2 million people in the country (24.4% of the population) spoke French as their primary language, and around 29.1% of the population has working knowledge of French. The French spoken in Switzerland is very similar to that of France or Belgium and has only minor and mostly-lexical differences. That is in contrast to the differences between Standard German and Swiss German, which are so many that mutual unintelligibility can cause both to be considered different languages. 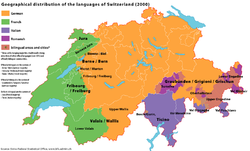 Swiss French is characterized by some terms adopted from the Arpitan language, which was formerly spoken widely across the alpine communities of Romandy but only by a few today. Also, expressions have been borrowed from both Swiss and Standard German. Although Standard French is taught in schools and used in the government, the media and business, there is no uniform vernacular form of French among the different cantons of Switzerland. For example, some German terms in regions bordering German-speaking communities are completely unused in the area around Geneva near the border with France. The use of the word septante for seventy and nonante for ninety as opposed to soixante-dix (literally 'sixty-ten') and quatre-vingt-dix (literally 'four twenties-ten') of the "vigesimal" French counting system. The use of the word déjeuner for "breakfast" ("lunch" in France, which uses petit déjeuner for "breakfast"), and of the words le dîner and le souper for "lunch" and "dinner" respectively (in French of France, déjeuner and dîner respectively), much like the varying uses of dinner and supper throughout the English-speaking world. The word huitante is sometimes used for eighty instead of quatre-vingts (literally 'four twenties'), especially in the cantons of Vaud, Valais and Fribourg; the term octante (from the Latin octaginta) is now considered defunct. 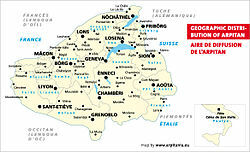 The word canton has a different meaning in each country; in Switzerland, a canton is a constituent state of the Confederation, but in France, it is a grouping of communes. In Belgium, it is a group of municipalities, but in Quebec, it is a township municipality. In France, a post office box is called a boite postale (BP), but in Switzerland (as in French Canada), it is called a case postale (CP). In colloquial Swiss French, the word natel is used for "mobile phone": "I didn't take my phone" becomes Je n'ai pas pris mon natel. France uses either portable or téléphone. adieu salut hello/goodbye In French, "adieu" means "farewell" and is generally never used except in cases where the people concerned will not meet again. In Switzerland it is used as an informal general form of greeting when people meet or leave each other. bonne-main pourboire tip (gratuity) Literally "good-hand". bourbine suisse-allemand Swiss-German This word is considered pejorative. carnotzet cave à vin/cellier/fumoir Wine cellar This expression can sometimes be found in France, in places close to Switzerland. cornet sac en plastique plastic bag In France, "cornet" would typically designate an ice cream cone. cutips coton-tige cotton bud/swab Antonomasia from the brand Q-tips which phonetically becomes "cutips" when pronounced in French. déjeuner petit-déjeuner breakfast Meal names are shifted in Swiss French, meaning that the name for lunch is used for breakfast, the one for dinner is used for lunch and the French equivalent of the word "supper" is used for dinner. dîner déjeuner lunch Meal names are shifted in Swiss French, meaning that the name for lunch is used for breakfast, the one for dinner is used for lunch and the French equivalent of the word "supper" is used for dinner. duvet couette comforter / duvet "Duvet" comes from the fact that comforters used to be filled with down feather (duvet). "Duvet" in France means sleeping bag, for similar reasons. faire la noce faire la fête to party This expression can also be found in Standard French even though it is probably less used or used predominantly by old people. fœhn sèche-cheveux hairdryer The name "fœhn" comes from the Foehn wind. fourre dossier/housse folder In French, "fourrer" means "to stuff". frouz les Français people from France - French This word is considered pejorative. galetas grenier attic Also used in Alpine regions of France, down to Dauphiné. giratoire rond-point, giratoire roundabout Comes from "carrefour à sens giratoire" which would translate to "circular crossroads". huitante quatre-vingts eighty In Swiss French, as opposed to French, the words for seventy, eighty and ninety are similar in construction to the ones used for thirty up to sixty. linge serviette towel In French, "linge" is a generic word that refers to clothing, bed sheets and towels. mutr mère mother Comes from the German word for "Mother", "Mutter". nom de bleu ! nom de dieu ! in the name of god!/god dammit! nonante quatre-vingts-dix ninety In Swiss French, as opposed to French, the words for seventy, eighty and ninety are similar in construction to the ones used for thirty up to sixty. poutzer nettoyer to clean Comes from the German word "putzen" which means "to clean". réclame publicité advertisement "Réclame" is an older disused word for advertising in French. septante soixante-dix seventy In Swiss French, as opposed to French, the words for seventy, eighty and ninety are similar in construction to the ones used for thirty up to sixty. service je t'en/vous en prie you're welcome From "à votre service" meaning "at your service". souper dîner dinner Meal names are shifted in Swiss French, meaning that the name for lunch is used for breakfast, the one for dinner is used for lunch and the French equivalent of the word "supper" is used for dinner. vatr père father Comes from the German word for "Father", "Vater".